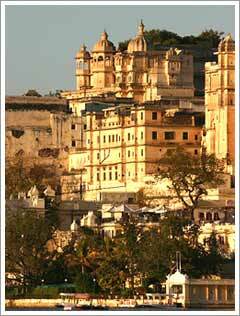 Nesteled in the foothills of the Aravalli Range, Udaipur was once the capital of the Rajput kingdom of Mewar. It was founded by Rana Udai Singh. The city of Udaipur is known as the city of lakes or Venice of the East. It is dotted with beautiful lakes such as Lake Pichola, Fateh Sagar, Udai Sagar and Swaroop Sagar which attract a lot of tourists from India and abroad as well. One of the most celebrated tourist destination, Udaipur also has several palaces,forts, museums and temples holding sheer historic importance. Come to this wonderland and get a glimpse of some of the most luxurious heritage hotels of the world. The Lake Palace Hotel which is located in the middle of the azure waters of the lake Pichola is the most beautiful. Udaipur has several tourists attractions— the city palace, Fateh Prakash Palace, Nehru garden,Jag Mandir, Saheliyon Ki bari garden and temples. If you are a car freak and want to see the taste of the erstwhile Maharajas, pay a visit to the Vintage Car Museum. It displays around 24 cars of the bygone era. The bazaars(market) of the city sell beautiful miniature paintings,terracotta tables and plaques, tie and dye fabrics,wooden toys,white metal objects, silver enamel artifacts and images of Lord Krishna. Shilpgram,the craft village is the best place to see the wonderful handicrafts of Rajasthan. Udaipur is also a site of the Udaipur Solar Observatory,one of the six stations participating in the international Global Oscillations Network Group(GONG).This group was established with a goal of determination of the physical properties of the solar interior. Udaipur faces temperature between a maximum of 42ºC and a minimum of 28.8ºC .Winters are a little cold here as the temperature sometimes drops to 2.5ºC. The best time to tour Udaipur is from September-March. Regular Indian Airlines flights connect Udaipur with the major cities like Jaipur, Jodhpur, Mumbai and Delhi.The Indian railway connects Udaipur with Delhi, Kota, Mathura, Chittorgarh and Mumbai.